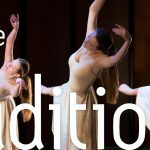 Guelph Youth Dance is excited to welcome back an excellent roster of professional teachers. Kelly Steadman will teach the ballet and jazz classes, Ashley Perez Hip Hop, Janet Johnson Contemporary Technique and Conditioning and Catrina von Radecki will teach Creative Dance and Improvisation/Composition. It’s an exciting summer for the teachers! After three years of summer training in Seattle Washington with Stephanie Skura, Catrina is now a certified Open Source Forms teacher. Open Source Forms focuses on cross-fertilizations and deep commonalities of Skinner Releasing Technique and creative process, guided by the philosophy that the source of creativity and wisdom is available in each of us. Catrina is excited to integrate these deeply inspiring new practices into her classes and has dedicated her August to class planning for the upcoming year! Ashely is currently in Africa dancing with Mix Mix Dance Collective at the Jeux de la Francophonie, where they were awarded Top 8! We will hear more from her when she returns! Janet spent the month of June launching back into Portal Dance’s new choreographic work, Broken with stellar dancers Katie Ewald, Robert Kingsbury, Lynette Segal, Kelly Steadman & Julia Stutz. They spent a lot of time exploring themes, refining choreographic language & then sharing with collaborators, musician Nathan Lawr and videographer, Scott McGovern. Broken will be premiered Oct. 20/21 at the new 10 C Space! Janet also studied and started her certification in Toronto for Gyrotonic-a fantastic, intelligent movement system with a state-of-the-art machine designed to strengthen our fascia, and create an integrated, strong range of mobility. As of the end of July is nested on the shores of Georgin Bay dancing in the clear waters, searching for blueberries and marvelling at each sunset….Re-charging the battery. Kelly Steadman’s June was filled with a wonderful rehearsal process for a new work by Portal Dance set to premier in the Fall. July saw plenty of cottage and camping time in enchanting cedar forests, plus festivals and yoga dates. Kelly also had a blast leading the dance component at the Arts Explosion Camp as well as at a local literacy camp. On the 21st her little guy Benjamin turned 4. He takes her on the best bike, art and nature adventures. On the horizon for August are road trips to Ottie Lake, Ottawa, Montreal and Missourri USA. Summer will wrap up with home reno projects that include building an indoor slide.